Have you noticed how connecting with customers has gotten more challenging? Gone are the days when brands called the shots, considering themselves the only experts. Consumers rule. Not only do they have infinite options, but they are digitally savvy, have access to knowledge and want to participate in the brands they care about. As marketers we must learn how to market in a world of demand. How Lay's Is Tapping Its Audience For Its Next Big Chip Idea - note how global the participation and the influence. 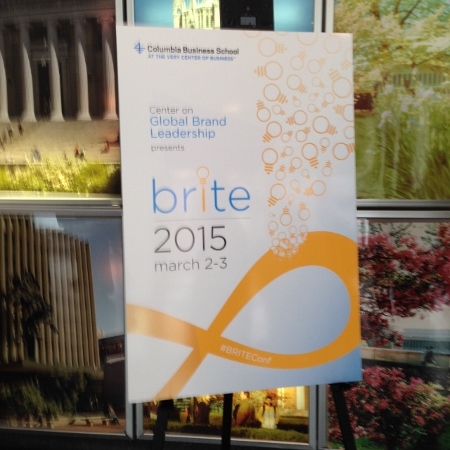 During BRITE'15, Columbia Business School's Center on Global Brand Leadership annual conference on Brands, Innovation and Technology, Ann Mukherjee presented The Science and Art of Marketing in 2015 to illustrate how Doritos has ignited its core customer. The world is shifting from a world of supply to a world of demand. How do you anticipate and predict demand and be in position to supply it in a world of infinite choice? Consumers don’t just buy brands, they buy into a brand. PepsiCo used to think about consumers as the potato chip consumer or an extruded product (i.e., Cheetos) consumer. It's much better to think in terms of how consumers think: my family, my issues at work. Marketers have to think how to fit into their lives. What is the definition of competition? "For the first time in history, barriers to competition are controlled by consumers. The boxes they build in their minds are the boundaries of brands." Marty Neumeier, Zag. Success in the new world of demand requires that marketers be ever curious and analytical about the science/analysis of marketing. The science comes from observing how people live and how that is predictive of choice and how to apply to brands. Marketers are growth strategists. Insights are important to unlock opportunities. Marketing is at the intersection of disciplines; it's getting to behavioral economics and informs the entire commercial organization. 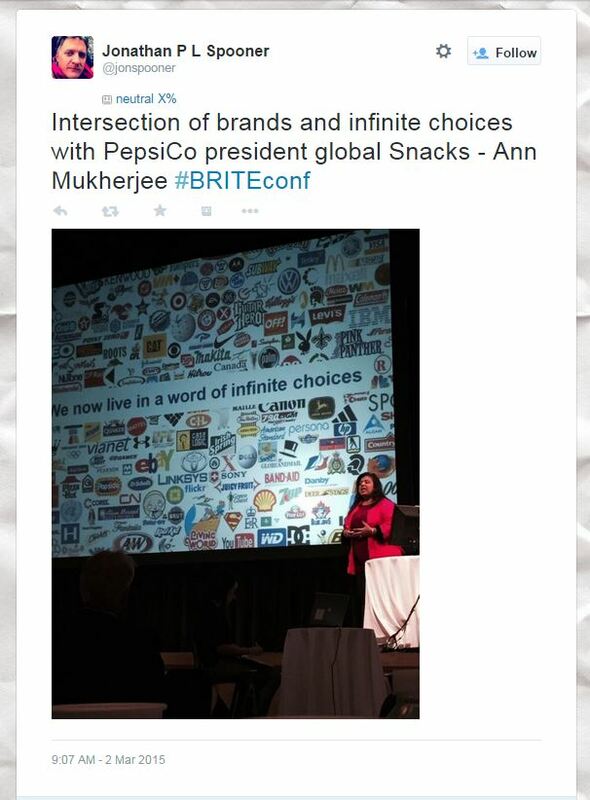 Mukherjee explained the need to understand the context for Doritos. It lives in the “young and hungry” for life category of consumers. The typical Doritos fan (aka persona) tends to be young and male. Metabolism drives their choices. It’s a global audience trying to figure out what should be vs. what could be. He wants to experience life vs. things; he's comfortable with technology and loves music. "Last year, the behemoth vending machine stage was interactive, allowing people to control things like the lights and smoke machines and even pick performer LL Cool J's encore song through Twitter." To get the word out, Doritos relied not on traditional media, but rather on its fans by going to LA the morning of the conference, speaking to people in the street and asking them “are you bold enough?” now or never and be kidnapped to go to SxSW. Roarke Boes accepted. His account via Twitter and Instagram ignited consumers around the globe. After all, consumers don’t care to hear about companies or brands. They do want to hear from other consumers. See Doritos For the Bold for a full description of the campaign. 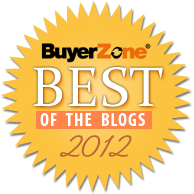 How can you get found online when potential customers have so many options to choose from? Marty Neumeier refers to "competion is clutter." That clutter is everywhere. >> See Avoiding 'Paradox of Choice' When Connecting With Customers which includes references to BRITE'11. The most effective way to cut through clutter and infinite choices is to fully understand who your prospect is. In other words, it's important to identify and develop your customer personas and understand what motivates them to purchase the products or solutions you offer. As Ann Mukherjee stated, you have to think how you fit into their lives. In a world where customers don't care to hear marketing talk from companies or brands, how might you engage others to talk about you? 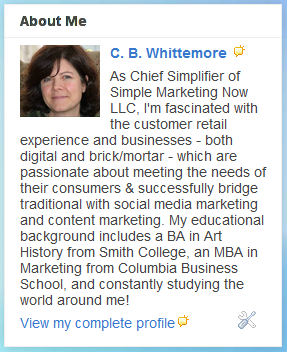 How might you offer them truly helpful, exciting and talkworthy content? How can you shift your focus to your customers? And then, how can you test and analyze, experiment, gather data and insights while staying humble and close to your customers? What have you tried lately to cut through the clutter and connect with your customers? Let me know in the comments.